According to the correspondence received by the NCC, copies of which were obtained by the Citizen through the Access to Information Act, dozens of complainants saw the NCC's decision to take down the portrait as "cowardly" and "utter nonsense." Several writers described the Lord Durham portrait issue as anti-democratic, going so far as to compare the NCC to a dictatorship. "This action that the Crown Corporation has taken smacks of something that would be done in a country under the rule of a dictator, not in a democracy," wrote one complainant. "It is the NCC that should be apologizing to the Canadian public for letting us down in providing a showcase for the events, people and debates that have shaped our country," wrote another. "Your steps are more appropriate to Soviet-era revisionism than the flourishing democracy that you purport to represent." The NCC took down Lord Durham's portrait on Nov. 5 after a media report pointed out that francophones might take offense to his inclusion in the outdoor exhibit on Sparks Street that celebrated the 150th anniversary of the selection as Ottawa as the capital of Canada. He was the author of the Durham Report, a controversial document written in 1839 that recommended the assimilation of French Canadians into English society on the basis they had no significant history or culture. When the portrait was pulled, NCC chief executive officer Micheline Dubé said "the recommendations put forth by Lord Durham at that time are considered inappropriate for many and certainly controversial." One complainant wrote directly to Ms. Dubé, calling for her to take responsibility on behalf of her organization: "I think that you owe all Canadians an apology for acting as a revisionist, the latter a trait of countries in which democracy is not likely to exist." NCC chairman Russell Mills, a former editor-in-chief of the Citizen, also took his licks: "With respect to you and Lord Durham, should one not be astonished that someone who had gone to the wall for press freedom, should now be presiding over the business of censoring history?" Others were more direct: "Get a spine! This is once again another example of the whitewashing of Canadian history to please the francophone lobby." The Durham brouhaha was an unlikely source of negative press for the NCC throughout November. The NCC's urban-design experts have done a detailed analysis of how the new building on Colonel By Drive will affect postcard views of the capital. This includes a three-dimensional video showing what the views of downtown will be like once the new building is in place when people are driving along Colonel By Drive toward Rideau Street. The new convention centre will block some views, notably the view of the historic Château Laurier, considered a landmark in the nation's capital. The NCC's design advisers wanted the Congress Centre project team to increase the setback of the building by five metres to preserve more of the view of the rooftops of the Château. [...]The Congress Centre project team has slightly shrunk the size of the building twice since the summer, when they first met with the design advisers of the NCC. NCC chairman Russell Mills said there is no doubt that the commission is trading off some design preferences to get the new building. But he said the board must address other elements beyond design because the capital city needs to think about "getting people here." [...]The new building project does not intrude on views that are specifically protected in Ottawa's official plan. The bigger new building will require that Colonel By Drive, in front of it, be realigned and reduced from four lanes to two. The ground floor will have a large entrance area, while the second and third floors will overhang that pedestrian area. The building will be about 20 metres tall. No doubt the convention centre is relieved now that they have the NCC seal of approval. And who better to advise on sightlines than the masters of design behind DND HQ. The Gréber plan, unveiled when the automobile reached its ascendancy, is out of date with today's environmental concerns. So too is the Greenbelt. Areas such as the farmland between the city and Kanata as well as between the core and Orléans has no special environmental significance. So too the agricultural land bordering Greenbank Road. Rather than develop working farmland at the far reaches of Ottawa's suburbs and extending the polluting commutes of its residents, why not develop land of little consequence inside the Greenbelt nearer Ottawa's downtown? [...]Mr. Mills is correct again when he says that intense development in the Greenbelt would contribute to making rapid transit successful. Right again on the need for an east-end bridge to get heavy trucks out of downtown. Bang on concerning opening the region's river and canal banks to people. Correct yet again on the importance of a national portrait gallery to the capital. All this requires a second Gréber plan, for all those reasons and one more. An independent study would operate above and beyond city and NCC planners who have done a magnificent job of profoundly botching planning the area outside the Parliamentary district. The list of NCC planning debacles is too large to list in this space and city planning appears confined to building tract housing and big malls with huge parking lots. Which brings me to my one quibble with Mr. Mills's musings on the future of region and the NCC. Other than trans-provincial traffic (and Mr. Mills would do well if he could find a way to get the Prince of Wales Bridge carrying commuter rail), the Crown corporation should not play a role in transportation. It has little experience and the NCC's track record in planning where it has some knowledge is appalling, let alone on transportation. For all its failures, at least the city has run a bus service and might some day create a functioning light-rail service. By a "second Gréber plan" then, he means a plan that is different from the original plan in every important respect: not automobile-centric, and not implemented by the NCC. With one of the Greenbelt's two chief purposes in ruins, it's reasonable to discuss whether parts of it can be put to better use, as Mr. Mills (a former publisher of the Citizen) proposes. Finding urban uses for parts of the Greenbelt must not be done hurriedly or arbitrarily. The jury will be staying out on the NCC's development of LeBreton Flats for a long time, but in principle, it's a bad example to follow: the commission kept the land for 40 years before devising a competition to develop it that was so problematic that, in the end, only one builder bid for the rights to the most sought-after parcel in Ottawa-Gatineau. That's no way to run the NCC lands. The federal government owns large expanses of the Greenbelt with no special characteristics. Do we build on these or increase urban sprawl? Do we continue to encourage long, polluting drives from the far suburbs? This will clearly be a difficult decision. The old NCC, with its closed and paternalistic culture, wouldn't have been up to the job. It might not be yet, but perhaps under Mr. Mills, who is opening board meetings and promising a new level of public engagement, the commission can do the job right. As well, Mr. Baird said thinking about selling or developing parts of it would be problematic because farmers had their land expropriated in the 1950s so the Greenbelt could be created. Turning it over to development would raise ethical and legal questions about who should profit from the land development, he said. He said any move to development in the Greenbelt will get a hostile reception from voters. "The overwhelming majority of people I represent will have the same concern," said Mr. Baird. In the east end, we're all too familiar with the NCC's environmental vision. Practices such as selling off the Woodburn farm and surrounding forest to the highest bidder to make way for parking lots, big-box stores and a gas station shows the NCC's concern for the environment. Instead of seeing the Greenbelt as Ottawa's jewel in the crown, the NCC sees the Greenbelt as its private cash cow. "There is an awful lot of gasoline being burned in Ottawa every year by people driving through the Greenbelt. It's not environmentally sound. "There needs to be some long-term assessment of the future of the Greenbelt," he says. It "was a good thing in its day, but it was intended to contain the growth of the city and it didn't." Mills says the Greenbelt is a "sacred cow" and "the people of Ottawa would rightly resist just opening it up to development, but it seems to me we can make better use of it, more environmentally sound use of it, than we do now." Mills is particularly interested in large swaths of fields on both sides of the Queensway between Kanata and Bells Corners, and on the 174 leading to Orleans. While it's "nice to look at out the window," it might make more sense to develop it. The NCC chairman's willingness to at least consider such a change could be an important factor as the city revises its development plan. City bureaucrats have also been quietly discussing the idea of Greenbelt development and will release a discussion paper on it soon. All well and good, if they could avoid building just another Terry Fox Business Park, but really, what are the odds? Mills also likes the idea of a bridge across the river in the east end, and a portrait gallery of some kind. In a lengthy column today, Citizen editorial writer Ken Gray asks whether the NCC's planning in Ottawa succeeded in creating a great national capital, and whether Gréber's grand plan worked. His short answer: no. The National Capital Commission and its predecessors created the majestic capital driveways in response to that great North American pastime of a half-century ago - the Sunday drive. The Gréber plan resulted in the triumph of the car, a legacy that remains today. These driveways - Colonel By, Queen Elizabeth, Rockcliffe and the Ottawa River Parkway - helped create urban sprawl by making car travel to the suburbs easy. They also cut off neighbouring communities from the waterways that they showcased for car passengers by creating an asphalt barrier to the shorelines beside which they were built. [...]As a result, there is but one people place along the long expanse of the parkway that stretches from Carling Avenue to the parliamentary precinct. That's Westboro Beach, access to which is facilitated by a tunnel under the parkway. The national capital region has three major rivers and a UNESCO world heritage site in the Rideau Canal. But, in part due to the NCC driveways, we don't think of Ottawa as a water city. Again that's the result of the 1950s triumph of the car. In San Antonio, Texas, along its canal, there are restaurants and entertainment establishments that create the River Walk. In Ottawa, we have bicyclists and the occasional jogger along the river but nothing like the kind of people activity the River Walk sees. The Texas example is a tourist spot unto itself. Instead, here, if you want a rather eerie, perhaps dangerous, certainly lonely walk after dark, trundle along the Rideau Canal. In the 1950s, the city almost seemed as though it were in the way of the capital. Car-oriented suburbs took employees and their families far away from the majestic Parliament Buildings. LeBreton Flats, a real neighbourhood with a significant heritage, was razed, in part, because it was seen as an eyesore too near the parliamentary precinct. Tramways were perceived as a blight with their unsightly overhead wires. They were eliminated in favour of the car and the bus. Train lines were lifted because their smoke and noise destroyed the tranquility of the capital. Trains downtown were seen as obstacles to road travel. During the light-rail debate, that same argument was heard from merchants on Slater and Albert streets. In addition, back in the 1950s, industry appeared to destroy the parliamentary vistas. Thus the heritage of Gréber is a one-industry government town, with a lack of private enterprise, little modern mass transit, and urban sprawl created by suburban planning and the individual mobility of the car. The city was but an afterthought for the pioneering planners of the 1950s. The new NCC CEO has finally been appointed - Marie Lemay, "an engineer with extensive municipal experience in Western Quebec, was appointed for a five-year term. She takes on the job of chief executive officer in January." Also recently announced were two new board members - a Kory Bobrow from Montreal, who has served on various boards of some sort or another, and, somewhat more interestingly, former Ottawa mayor Jacquelin Holzman. The NCC, a creaky, out-of-touch bureaucracy, hunkers down behind the walls of the Chambers Building, fearing controversy and debate. On his castle throne, the woefully inaccessible Marcel Beaudry ponders the end of his 14-year reign. His tired, confused term concludes in September. So, open meetings it is. And the first, mostly open meeting is scheduled for November 7. Also on the Openness and Transparency agenda, the NCC will establish "public standing committees" of as yet vague standing, get an external ombudsman, and introduce an annual open house. There's also a survey on the always amusing NCC website, but only until October 12. The NCC has apparently been brainstorming in its bunker on Elgin on How To Be Open, and is now ready to reveal all to a grateful nation at a press conference today. The New Initiatives to Enhance Openness and Transparency will be wheeled out before the press at 10:30 am at NCC HQ on Elgin, Room 323, 3rd floor. More, no doubt, later. We sought out Guitard to find out exactly what used to be where the parking lots are now. As we had suspected, buildings had been there; but it was more lucrative for property owners to tear them down and build parking lots or to lease the land to parking lot entrepreneurs than to maintain the old buildings. Guitard walked us through the streets and pointed to the ghosts of homes, restaurants, cinemas, and hotels. [...]Which brings us to the obvious reason why Hull has as many parking lots as it does; thousands of people who are not residents of Hull work in the massive brown and grey government buildings, and probably the majority of them bring their cars with them. Of course, when it comes to urban destruction in the capital region, the NCC has to be involved somehow - and so they were. The lots were a natural consequence of the NCC's expropriation and destruction of large areas of downtown Hull to make way for the massive Place du Portage and Les Terraces de la Chaudiere office complexes - part of the NCC's building dispersal programme. Mission accomplished. Guitard has contributed to an interesting site on the architecture of old Hull, Remember When?, by Harry Foster, Manager of the Photographic Services section of the Canadian Museum of Civilization. It is one of Ottawa's most coveted sites -- a vacant two-storey building set among parkland, with the picturesque Rideau Falls cascading next door, an unrivalled view of the Ottawa River and Quebec, and a location just down from the official residences of the Prime Minister and Governor-General. The site of 50 Sussex Drive used to house the Canada & World Pavilion, a $5.7-million taxpayer-funded museum opened in 2001 by the National Capital Commission to draw tourists and showcase Canadian accomplishments. It featured, among other things, great sporting moments and Celine Dion's Grammy. Admission was free, but attendance was poor and the building closed four years later in 2005. It became a white elephant along this important stretch of road. The "NCC Watch" Web site dubbed it among Ottawa's "Tombstones of Waste." The Governor-General wants the site for the Chancellery of Honours, the office that looks after the Order of Canada and Bravery Awards, and for a public exhibit to focus on Canada's honours system and the Heraldry. The Ottawa Art Gallery, which houses a number of prominent Canadian works, is also vying for the space. The Australian High Commission is understood to have been interested and the NCC has acknowledged it has spoken informally to some embassies. A NCC spokesman said last week it has not reached a decision and is also looking elsewhere within the "federal family" to occupy the space, but did not provide a full list of those being considered. Mrs. Lajeunesse was walking her labrador, Molly, along the canal near the Arboretum early Friday morning when she [...] saw a small black and white dog, possibly a Jack Russell, floating about one metre from the shoreline. That day, she made phone calls to the City of Ottawa, the National Capital Commission and the Ottawa Humane Society, but was told by all three that the canal wasn't their responsibility. "Everyone was very happy to try and pass me along to someone else," Mrs. Lajeunesse said. "That's the problem, that no one was willing to take the time to help. Nobody seemed to know what to do." The dog's body remained floating in the canal waters over the weekend. On Monday, Mrs. Lajeunesse said she was told by someone at the NCC that the situation would be taken care of. "He assured me that they had a contract with whoever goes out there to clean these things up. He told me his name was 'Phillip' ... and said 'Don't worry, Mrs. Lajeunesse.' "
But when she returned to the canal on Tuesday morning, she was shocked to see the dog's body was still there. "I was so angry. This thing was rotting in the canal. Imagine the smell, imagine people walking around with young children, imagine how they feel, especially dog owners who just think it's appalling," she said. Incensed, Mrs. Lajeunesse called the NCC again. To her surprise, she was told no one named 'Phillip' worked at the NCC call centre, and she should try Parks Canada instead. Turns out Parks Canada operates a scum patrol in the summer for just this eventuality; the NCC assumes command of the canal in the winter. Staffers wandered through the crowd chatting and with walkie-talkies squawking during the performance. The food-and-drink tent was grossly understaffed, with a constant line about 40 people deep just to buy a cup of coffee, served from a single urn. Two poor teenagers laboured away trying to serve everyone while two other staffers trundled fresh coffee in from somewhere inside the War Museum (on a trolley that couldn't make it through the specially-chosen turf) and ferried empty urns back in as fast as they could. When the single available urn ran dry before the next came out, the young lady who was running the cash as efficiently as she possibly could have began to look utterly shell-shocked and mouthed an extremely bad word. ... and maybe they would be, if they had any shame. Instead, they had NCC commercial after NCC commercial lauding the attractions of Canada's Capital Region, playing at high volume on the high-powered screens that showed the performance to people too far away from the stage to see the real thing. The performance was scheduled to start at 8:30, but actually that's when they started 45 minutes of self-congratulatory speeches from ... well, I was standing in the coffee line so I didn't catch them all, but they included NCC chairman Russell Mills and president Micheline Dubé, Governor General Michaelle Jean, and the evening's strangely hyper emcee whose name escapes, but who went on at such excruciating length about the magic of the evening that eventually the crowd of operagoers tried to applaud him down. Then they played O Canada, and then he came back and started talking again, and people actually began to laugh. At intermission, another round of godawful NCC commercials, and then the emcee conducted an incomprehensible interview with Canadian Opera Company conductor Richard Bradshaw (half of which was in French, though Bradshaw doesn't appear to speak it) and soprano Isabel Bayrakdarian, who was the only one of the three who knew how to use a microphone. [...]The NCC's creepy brand of cultural paternalism makes even the good and ambitious festivals and shows it supports seem infantile, and that's definitely not good for Ottawa's civic pride. The National Capital Commission is launching a major $175,000 study of federal land holdings in the nation's capital, including such landmarks as the Central Experimental Farm and Leamy Lake Park, to determine how they fit into the continuing development and evolution of the capital. [...] The project is expected to begin next month and take a year to complete. In the past, much smaller studies have been engulfed in controversy because some residents saw them as an attempt to identify surplus land for sale. But Francois Lapointe, the NCC's director of planning, says this has nothing to do with land development. He says the properties in question are so fragmented that a comprehensive study is needed to establish a broader vision for them. [...]"This study will identify what we are going to do with the lands. They are public lands and it is not our intention to develop housing or anything like that. Public access is critical and that is something we will preserve and enhance." Mr. Lapointe says in all cases, the NCC will pay particular attention to how to "animate" these properties. As an example, he points to the Ritz on the Canal restaurant, which he says has enhanced the Rideau Canal; consideration has to be given to whether something similar is appropriate for other areas. He also cites Wesboro beach, which has added to the enjoyment of the Western Parkway, and says there may be room for further improvements. Mr. Lapointe wondered, for instance, whether the scenic drive on the parkways could be enhanced by the addition of selected services that would allow people to stop for coffee or a cold drink. "These are the things we are looking at. The capital has been around over 100 years and things change." Having spent the last 100 years expropriating every inch of shoreline, apparently to ensure that precisely nothing ever will change, the NCC's focus on animating its well manicured and empty waterfront properties seems rather odd. And how's that for an example of the worst thing that could possibly happen - housing. Next thing you know, condos, shops, places to go - the horror of it all. Still, Mr Lapointe's caution is warranted. Having also spent the last 100 years selling themselves as environmental stewards, safeguarding symbolically meaningful national interest land masses, they can hardly be surprised when the public objects to any plan to develop some scrap of land that's suddenly no longer symbolically meaningful or interesting. Good luck with the survey, guys. Mayor Larry's transit task force has released its transit plan, and what do you know, they propose turning Union Station into a hub for a new rail transit network. Of course, it was a major transit hub until the NCC started its good work back in the 50s, first proposing to demolish it, then letting it fall into disrepair and allowing public works to essentially vandalize the interior. So that's 30 years down the drain and one more repudiation of the NCC's planning then. To name one of the chief critics of the Crown agency, through his newspaper days, to run it speaks volumes. His appointment is a stroke of political genius by Transport Minister Lawrence Cannon, no doubt aided by Environment Minister John Baird, the political minister for Ottawa. The best way to defuse your critics is to appoint one to the top job. It is a rare bit of political insight on the Conservative government's horrid local file, but you take your genius where you can get it. The fly in the ointment is just how much power Mr. Mills will have. For at the new NCC, there will also be a chief executive officer. Will that person be the straw that stirs the drink. [...]Recently, Mr. Cannon, who is responsible for the NCC, said he is impressed with the open processes at Ottawa City Hall (too bad the city is becoming more secretive). That might be the tip that the mandate review's position on openness would be adopted in future reform. Let's hope so. This public process would build trust if handled well. No doubt, old-time NCC administrators would strive to keep the process secret, as has been their wont. That's where Mr. Mills would come in with his well-honed journalist's instincts. He should question, as he certainly will, NCC staff attempts to keep information private. Withholding information should be the exception rather than the norm. Beyond this, Mr. Mills must establish what the role of the NCC is in the capital. Prior to municipal amalgamation on both sides of the provincial border, the NCC needed to be an overseer of the national interest in the face of the conflicting positions from myriad cities. Now with amalgamation, two formidable municipalities have been created, often with expertise, particularly in planning, that far exceeds that of the NCC. In terms of consultation, implementation and creating area-wide blueprints such as the official plans, the cities have not only grown up, they have left the NCC in their dust. The Crown corporation has become a ponderous, bureaucratic body that dallied for years over impractical schemes for such sites as the city core, the Daly site and LeBreton Flats. The review panel would like to see a reinvigorated planning and heritage function for the NCC. But the experience of the past decade and more show that the Crown corporation is out of touch with modern planning principles and basic efficiencies. Rather than being the leader in planning in the community, perhaps the NCC would do well to try to mediate solutions to cross-border transportation problems between governments and become an adjunct to the vastly superior municipal planning process. Perhaps the Crown corporation should approach municipalities with its projects in such a way that they build better cities rather than just being one-off grandiose projects. Mr. Mills enters the NCC with an enormous task in front of him at a critical time. Never has the Crown corporation's stock been so low. He must build an organization that is open and that residents can trust. As well, the new chairman must revolutionize from within so that it produces projects that result in improved cities. In that way, it can be a force to create a better capital to benefit all Canadians. The NCC must think local to produce a stronger Ottawa-Gatineau that will be an inspiration to the rest of the country, not only culturally but from an urban-planning perspective. Mr. Mills's appointment is an enormous opportunity to create an invigorated, useful, trustworthy NCC. It should not be lost. Gov. Gen. Michaelle Jean wants to take over the former Canada and the World Pavilion at 50 Sussex Dr., a $5.7-million building beside the historic Rideau Falls with stunning views of the Ottawa River. The Citizen's story and editorial this week on the fate of the site -- how the Ottawa Art Gallery wants the building but fears a deal has been struck to put Rideau Hall staff there -- prompted a letter from Rideau Hall yesterday, confirming that the Governor General's office wants the space. Sheila-Marie Cook, secretary to the Governor General, says the pavilion -- with its high visibility, prestige and abundant exhibition space -- would be an ideal place for the Governor General's Chancellery of Honours. The building became vacant in 2005 when the National Capital Commission, which had used it as a small museum showcasing Canadian accomplishments, closed it to save money. But John Baird, the senior political cabinet minister for the capital region, yesterday said he thinks it's a terrible idea. "A prime piece of property like that, it just seems silly. I don't support it. It's on the ceremonial route. Putting the Governor General's staff there is ridiculous," said Mr. Baird, in a meeting with the Citizen's editorial board. "It shouldn't be used for that purpose. Surely to goodness there's a better use for that prime real estate." Mr. Baird, the MP for Ottawa West-Nepean, said he's open to the idea of putting Ottawa Art Gallery works on display and therefore keeping it all public space, but that he doesn't have enough information about the proposal to endorse the idea. If picked up by the Governor General, the space would accommodate about 35 staff members, including researchers, artists and the staff who process nominations for honours. [Acting NCC CEO] Ms. Dube said yesterday that she received notice on April 2 that Rideau Hall wanted the property, but could not disclose to the gallery group, or the public, the nature of the proposal. She said the project was first raised in a letter from Ms. Jean to Prime Minister Stephen Harper, who passed the matter to Public Works to handle. Ms. Dube said it was not her place to be announcing a project of the Governor General. She added that the NCC has received a request from Public Works for a licence of occupation of the pavilion so that the Governor General's staff can begin using the space by July 1. Journalist Sarah Jennings, who has supported the Ottawa Art Gallery in its push for the federal building, said it's important that this place be kept for public, cultural space, given that historic Sussex Drive has been swamped with high security offices and embassies in the last decade. She has hope that the gallery idea might still fly, if the public rallies behind it and the government backs away from spending money fitting up the building for the Chancellery of Honours. "There's no Ottawa on Ottawa's Mile of History and this is the ideal solution," she said. "It's absolutely wrong to put this iconic site into office space for bureaucrats." To support the Ottawa Art Gallery's campaign, sign their petition. Lawrence Cannon made Russell Mills' appointment as chair of the NCC official at a little ceremony today, taking the opportunity to appoint some chap called Jason Sordi to the board at the same time. According to the Transport Canada news release, Sordi is a "senior account manager, commercial financial services, for RBC Financial Group. He has also worked as an event planner, regional project manager and representative for the Canadian Unity Council" - whoever they are. Mills said he will focus on a recommendation by an external review panel to bring more accountability and openness to the agency that manages federal properties in the Ottawa-Gatineau region, which has often been criticized for its secrecy. "I believe that transparency is the greatest promoter of accountability in public institutions," Mills said. He told reporters that he fought for public openness during his own 35 years as a journalist. "The fact that the government chose someone like me to be the chair is a pretty strong signal that that's what they want, too." Jim Watson, a former mayor of Ottawa and current Ontario cabinet minister, who has been one of the NCC's toughest critics, said putting Mr. Mills in charge of the board spells the end of the Beaudry-era closed meetings. "It's a great appointment. His appointment sends a pretty clear signal that the government expects the NCC to be much more open," said Mr. Watson. "Russ is well known for being a great advocate of openness and transparency. I'm very optimistic about the future of the NCC under his guidance. "It's an appointment that will be well received by us who have been fighting to make sure the NCC is more accountable, more open, and really more a part of the community," said Mr. Watson. "He's a true community advocate and that's the kind of person that you like to see in an organization like the NCC." "It's an excellent appointment," said Jacquelin Holzman, a former mayor of Ottawa. She hopes Mr. Mills will lead a revival of pride in the capital. She said Ottawa should be as revered by Canadians as Washington is by Americans, but that's not the case and it needs to be turned around. Ms. Holzman said Mr. Mills' experience with a wide number of boards in the corporate and charitable sectors means he understands that the board of directors gives overall direction, rather than micromanaging the organization. Ottawa Centre MP Paul Dewar, one of the most knowledgeable critics on the NCC, said the appointment of Mr. Mills is "an interesting choice" for the government, and he views Mr. Mills as "a decent person." He says "any change, to some respect, is welcome." The former Citizen publisher has always been a champion of openness at the NCC, and so his selection sends a positive message about the direction of the organization. The problem is, the new chairman won't be running the organization day to day, and his role might be more ceremonial than consequential. In every organization, someone has to lead and it's not likely to be a part-time board chairman. Given his stance in the past, Mills certainly has to open the organization's board meetings, but the NCC's secretiveness is just a small part of its problem. Despite a recent mandate review, it's far from clear what value the NCC really adds. Finding a useful role is the real challenge for the new chairman and the yet-to-be-appointed CEO who will actually run the NCC. The board meets only four or five times a year, essentially rubber-stamping the work of the bureaucracy. The public ought to expect more, and one value of opening the meetings might be to show us if the board members are making a real contribution or are just in town for the free lunch. The NCC could gain more ground on openness by releasing every possible document -- not making people chase them under access-to-information rules, then treating the contents of the reports like state secrets. What the NCC really needs is a visionary with a tremendous grasp of urban planning, but there is nothing in Mills' past to indicate he's that sort of person. In choosing Mills, the government has at least recognized that the board chairman needs to know this community, not just be the "person of significant national stature" envisioned by the group that reviewed the NCC mandate. NCC critics would have been happy if the federal government had shut the organization down, but the truth is, the federal government likes the NCC because it gives it a tool to do as it pleases in Ottawa. For that reason, the NCC is not going away any time soon. At least in Russ Mills, we have an NCC chairman who won't confuse his role with that of a divine right king. Russel Mills, a former publisher of the Citizen, will be appointed the new chairman of the NCC. The official announcement will take place tomorrow (Thursday, May 3) at 12:45 p.m. at the Capital Infocentre. The appointment is for five years. This follows the recent appointment of three new board members and the splitting of the CEO and Chairman at the NCC into two separate positions. According to the Citizen, "Mr. Mills had a long newspaper career that began as a reporter with the London Free Press and included several executive positions with the Southam Newspaper Group. He is dean of the Faculty of Arts, Media and Design at Algonquin College." He is perhaps most notorious for being sacked from the Citizen by the Aspers back in 2002. "My problem (with the appointment) is the process," said Ottawa Centre NDP MP Paul Dewar. "They don't seem to have a comprehensive idea of what the NCC should be and I'm extremely critical of the fact they haven't brought in the Public Appointments Commission." Without the appointments commission involved, Dewar says the public has no way of knowing the expertise or number of applicants for the top job. "It (the appointment process) should have been done in a more public way and had an oversight so we would have seen the candidates and their resumes and seen the best person for the job," he said. Contrasted with Ex-Chairman Beaudry, Mills should at the very least bring a fresh outsider's perspective to the job, being neither a former developer or politician, and, as a former ink-stained wretch at the Citizen, a little less mistrust of the press and a more relaxed attitude to open board meetings. NCC Watch wishes Mr. Mills full enjoyment of his new sinecure. Next up, a new CEO. What the NCC's control freaks did next, rather than admit its planners are less than demigods, was plant a buncha unsightly shrubs across either end of this straight line, to try to passively force people back onto the sidewalk. Didn't work. Bipeds continued to wear a long, straight path through the shrubs, across the grass. Imagine that. Since that proved unsatisfactory, the NCC planted even more unsightly snow fences in the middle of the two shrub beds to make 'em harder to traverse. From my lurking lair I still see people stomp down snow fences on occasion. Imagine that. One of the smartest park planners I ever ran across had no fancy planning degree, but a lotta horse sense. Entrusted with a big new park, he seeded it to grass, and left it that way for a summer. In fall, he looked at where walkers had worn the heaviest paths in the grass, and had all his sidewalks put right there, along the lines that people were walking anyway. I'm all for putting rich people in grotesque buildings and over-charging them. However, that should be left to the private sector, especially the hotel industry. The Daly site was special, and it ended up being used in a way that benefited the NCC (which still holds the lease to the property), the developer, and the tenants. The rest of us were welcome to drop by and enjoy the shucking. And that's what I suspect is brewing on LeBreton Flats. The "model home" near the war museum is ugly. The streetscape on the NCC's billboard facing Scott Street is cold, sterile, unpleasant, and unhappy-looking. And it shows the scene in the summer, when people are supposed to be having fun. My bet: people had more fun on the flats in the 1980s and 1990s, when they were used as unofficial parkland. The festivals that used the property, the temporary Cirque de Soliel, the crowds that turned out to watch Canada Day fireworks, the campers, the happy dog walkers - they'll all go the way of the original flats. And what will they be replaced with? Something that will put money in the NCC's account, but will short-change the rest of us. NCC meeting cost estimates "ludicrous"
So does the NCC embrace this new philosophy [of openness] and the community? Hardly, according to briefing papers by commission staff obtained under access-to-information law. Instead, the NCC produces arguments about how difficult it will be to bring openness to the organization. The notes say that contracts, Treasury Board submissions, third-party information, cabinet instructions, security and compensation will have to be held in camera. Furthermore, the corporation maintains it will cost $23,000 a meeting, held four times a year, to bring the public to the board. Ontario Health Promotion Minister Jim Watson, a long-time NCC critic, calls those costs "ludicrous." He says there would be some costs for advertising (that could point to a website) and some translation costs, but that the figure was way too high. Instead, the notes sound like a counterattack against openness. If the corporation's officers refuse to adopt a spirit of real public access, the yet-to-be-appointed new chairman should turf them out. The monks sold the chapel to the National Capital Commission for $50,000 during the 1970s and are now only tenants. The deal leaves the building in a kind of limbo. NCC spokeswoman Lucie Caron said any repairs are the responsibility of the tenants. Brother Armand Soubliere, 74, a Capucin monk who worked 28 years as a missionary in Chad before returning to Ottawa, said the cloistered order doesn't own the chapel and shouldn't have to pay for the repairs. Brother Armand said the monks may make an appeal to Meech Lake residents for help if the NCC doesn't repair the chapel. "A farmer gave us the land and the first chapel there was built in about 1910," Brother Armand said. "There used to be at least 30 or 40 seminarians who went there during the summer. "The only thing that belongs to us there now is the wooden statue of St. Anthony. I don't know how much it would cost to repair the outside beams that support the roof. Dominique Larocque has asked the NCC on our behalf to repair the building before it falls down." Brother Armand says the brothers spend at least $300 a year to paint and replace rotten wood. He said while they haven't asked the NCC for anything, it would be good if the commission did the repairs. In an interview Thursday, NCC spokeswoman Lucie Caron said that translation and meeting room costs would also be included in the estimate provided. Ms. Caron said the estimate was a ballpark figure and she didn't have a detailed breakdown of the different costs. The commission also argues in the internal report on the issue that the public might be frustrated by the large number of confidential items at board meetings. The commission says that in the previous year, only about three of the 20 items before the board of directors would have been aired in public. The commission argues that Treasury Board submissions, contracts, third-party information, cabinet confidences, security and compensation matters, as well as performance evaluations, are all confidential matters that would be held in camera, regardless. [...] The federal government held a review of the NCC last year, led by professor Gilles Paquet, who concluded there is "a culture of secrecy" at the commission and it needs "a cultural revolution." The panel, which reported on time and under budget, found that there have been "a series of flawed initiatives and public relations problems," and that it is increasingly viewed with suspicion because of recent sales of land for development to balance the books. The panel concluded that two ways to improve the public's regard for the commission are to give it more money so it can pay the bills without selling land, and to improve corporate sensitivity and communications by having advisory committees held in public with full public input. The four meetings of the NCC's board each year should be held in public, with members of the public able to observe, but not comment on the proceedings, the panel said. The minister responsible for the NCC, Transport Minister and Pontiac MP Lawrence Cannon, called the panel report "a refreshing direction" and "a good initiative," noting that lack of transparency at the NCC had been "an irritant for many years." A first response of the government came last week in the federal budget when the NCC got an additional $30 million over two years. Ms. Caron said Thursday that the NCC is awaiting the government's directions in response to the mandate review. "We're open to having open meetings," said Ms. Caron. MPP Jim Watson, who urged the NCC to open its meetings and is one of the former NAC board members who pushed for the NAC's openness policy, said the NAC experience showed that predicted "chaos and anarchy" never happened. [...] Mr. Watson said the NCC's current annual meeting held in public is little more than a "dog and pony show," and "a chance for the NCC to boast and brag." He said the NCC has thrown out many arguments over the years to keep the board doors closed. But he argues the commission is really something close to a municipal government, with planning issues that are best dealt with in public. "They're looking for any feeble excuse not to shine the light on their activities," he said. But he said the commission will find out that, if it does open meetings, "the sky doesn't fall down." The independent senator [Mira Spivak] wants Parliament to have control over the park's boundaries to protect it for future generations. Records show that between 1960 and 1997, the park lost 48 properties, covering 610 hectares, through sale or transfer. The park covers about 36,000 hectares. The NCC owns or controls 98 per cent of the park, while 855 hectares, or two per cent, is privately owned. Mrs. Spivak's private member's bill would give the NCC the right of first refusal when private land in the park is for sale. [NCC COO] Ms. Dubé told the Senate committee the commission's policy is to offer fair market value for private land, but the commission can expropriate property if there is a risk that it could be subdivided for development. Ms. Dubé said the NCC knows about people on ATVs damaging the western part of the park and has asked neighbouring property owners to report any violations. "We need more conservation officers to ensure that people respect the park regulations," Ms. Dubé said. "More money would allow us be more vigilant and have more conservation officers. "We would be able to better mark the park boundaries. We hope to be able to have signage around the entire perimeter by the end of the summer so people know when they are entering the park." The NCC plans to nail more signs to trees by this summer to mark the park boundaries. Ms. Dubé said the NCC should have clearly communicated the 1997 boundaries to the public to avoid the misconception that it was selling off land in the park to pay its bills. She said the commission has disposed of some of its properties to buy other land or finance capital projects, but it has increased the overall size of Gatineau Park by 700 hectares since the 1990s. When the government set up a panel to review the mandate of the NCC, one of the biggest criticisms presented was that the commission had turned from a protector of heritage and greenspace in the capital, into more of a developer-type force in the community. The panel, led by University of Ottawa professor Gilles Paquet, urged the government to boost funding by as much as $25 million per year. The budget infusion, if approved by Parliament, will add $5 million to the operating budget in each of the next two years. This will bring the operating budget to about $79 million, a figure that includes payments in lieu of property taxes to other governments. On the capital budget side, the commission will get an additional $10 million a year for the next two years, bringing the capital budget to about $26 million a year. Operating budgets cover day-to-day costs, while capital budgets cover expenses such as buildings and equipment. The commission has seen some additional funds in the last decade but they were always tied to specific projects, such as the cleanup of LeBreton Flats. The extra money means the NCC won't have to generate funds through land sales to keep operating, said Ms. Caron. But she said, in accordance with Treasury Board guidelines, the commission might still sell property that's judged to be not "national interest" lands. While it's too early to say what the immediate impact of the money will be, Ms. Caron said it will speed up the commission's work such as preserving cultural landmarks, building and maintaining roads and pathways. Actually, we know exactly what the immediate impact will be - the NCC will have even more freedom to do what they do best: screw up at our expense, with little accountability or oversight. The NCC has wisely cancelled their "Interest Group Meeting," pending the announcement of a new Chair and CEO. Over at the National Capital Commission, it's business as usual. The board of the Crown corporation recently got four new members. The four, announced by the office of Transport Minister Lawrence Cannon, have interesting pedigrees. As always, there are out-of-towners and patronage appointments. Daniel J. MacLeod is a New Glasgow, N.S., town councillor and has an interesting connection to Ottawa. He will be able to visit his daughter more often here because she is Lisa MacLeod, the Progressive Conservative MPP for Nepean-Carleton. His term is for three years. Joining Mr. MacLeod is Eric D. MacKenzie, who was a Tory MLA in New Brunswick. Mr. MacKenzie was also a teacher in New Brunswick for 36 years. He also has a three-year term. Political patronage at the NCC is nothing new -- the Liberals did it, now the Tories are doing it. But what is disconcerting is that, in light of a review panel ordered by the Tories into reforming the archaic institution, the same old stuff is unfolding at the Crown corporation. Mr. MacKenzie and Mr. MacLeod are no doubt nice, well-meaning people, but what do people from the Maritimes know about Ottawa-area issues? How many people in New Glasgow and Fredericton even know what the NCC is? Will these two men know anything about the history behind the Federal Court decision on the Champlain Bridge? Will they understand how many times the heritage Britannia area (the most convenient, low-cost spot for an interprovincial bridge) has been wrongly threatened by a span across the Ottawa River? Have they any idea how important it is to get dangerous heavy trucks out of downtown? Board members chosen from outside the region simply don't understand the big issues, let alone the nuances, of the national capital. We hold out more hope for Robert Tennant, an Ottawa resident who is a registered professional planner and a member of the Canadian Institute of Planners. This is the kind of person who theoretically should bring some knowledge of how modern cities should be developed. His term is three years. The final appointment was Helene Grand-Maitre of Gatineau who is the vice-provost of l'Universite du Quebec en Outaouais. Her term is for four years. Cannon spokeswoman Natalie Sarafin said his office is studying the review panel's recommendations and any changes that would be needed to the NCC Act to facilitate those changes. The office will make an announcement when a decision is made, Ms. Sarafin said. Translation: Given some of the appointments plus Ms. Sarafin's statement, it sounds very much like changing the NCC is not high on Mr. Cannon's agenda. Lawrence Cannon announced some new appointments to the board of directors of the National Capital Commission. NCC Watch wishes Ms. Hélène Grand-Maître, Mr. Eric D. MacKenzie, Mr. Daniel J. MacLeod and Mr. Robert Tennant full enjoyment of their new sinecures. Gemma Kerr, president of the alliance, says allowing another embassy or federal office building will make Sussex Drive even more of a street that's dominated by high-security buildings, shut off from public access. "It's goodbye to free public access," if either an embassy takes over the building, or a federal agency or department moves in, said Ms. Kerr in an interview. "I do not want to see our ceremonial way become just a line of embassies." Without public access, Sussex Drive will lose its historic function as a ceremonial route, she said. [...]The NCC says it will preserve public access to Rideau Falls in whatever deal is struck and it will carefully consider proposals to renovate or add on to the building. The community is highly skeptical that public access would be maintained, given what has happened over the last quarter century along Sussex. The street, famously known for the prime minister's residence and Rideau Hall, residence of the Governor General, is part of Confederation Boulevard, dubbed Ottawa's "mile of history" by former NCC chairwoman Jean Pigott. But the street has become the "mile of security" in recent years. The NCC gave the green light to build the United States Embassy after a proposal to build it on Mile Circle at Rockcliffe created a community uproar there in the 1980s. The NCC also allowed the governments of Kuwait and Saudi Arabia to build well-secured embassies on Sussex. The Aga Khan is taking over the former Canadian war museum on Sussex and is making it the Global Centre for Pluralism. The federal government took over the former Ottawa city hall on Green Island. Rideau Hall was closed to the public for a short period when former governor general Jeanne Sauve closed the gates in the name of security in the 1980s. After a community uproar in New Edinburgh, the huge property was reopened to the public. "There's barely a property left that's not embassy. I'm not anti-embassy. I'm just trying to keep this mile of Canadian history," said Brian McGarry, the Conservative candidate in Ottawa Centre. "I'm trying to find a spot for it. There's really not much left." [...]Ms. Kerr isn't convinced the NCC, long criticized for its secretive operations, will give the Ottawa Art Gallery a fair hearing. She says the commission's deliberations on this matter are not taking place in the open. "We're seeing same old, same old," said Ms. Kerr. [...]Mr. McGarry said he'd like to see the NCC conduct a public discussion about possible uses of the pavilion. Time to test the NCC's newly declared interest in "Openness and communication with the public" and "Increased representation of Canada and Canadians in the Capital." While nothing's been heard from the government since the NCC Mandate Review Panel submitted its report last year, the NCC is suddenly interested in "Openness and communication with the public; Increased representation of Canada and Canadians in the Capital; and Use of new technologies to better communicate the Capital to Canadians." These topics will apparently be the focus of their occasional meeting with interest groups, this year to be held Wednesday, May 2, 2007, 6 pm at the Best Western Cartier Hotel, 131 Laurier Street in Gatineau. To be able to present your suggestions, you have to register and submit a written brief no later than Friday, March 23, 2007. The government has followed through on its promise to split the Chair and CEO functions at the NCC. The minor reform is intended to make the NCC a little less of a one-man show compared to the now mercifully ended Beaudry era. The measure comes into force on April 1, 2007. Mr. McGarry, selected as the Conservative candidate in Ottawa Centre last Wednesday, said Monday Sussex Drive is supposed to be the national capital's "Mile of History," yet there have been an increasing number of embassies permitted to build on it. "No offence to our foreign neighbours, but they have quite a lot of property already. Could we not preserve some for ourselves?" he said yesterday, in an interview with the Citizen. [...] Mr. McGarry - a prominent Ottawa businessman who served on Ottawa's public school board and on the city's former regional council - said the pavilion building is a perfect fit for the spectacular Canadian art in the Ottawa Art Gallery's Firestone Collection. The Firestone Collection was given to the Ontario government, and subsequently the City of Ottawa, by the late O.J. and Isobel Firestone, who travelled across Canada collecting art. But gallery supporters have been unhappy with the poor public display of the collection at Arts Court, an old building on Daly Avenue. They say it makes sense to have at least one presence from the City of Ottawa along the capital's Confederation Boulevard, sometimes called Ottawa's Mile of History. Last week, Mayor Larry O'Brien publicly threw his support behind the idea of moving the gallery to 50 Sussex Dr.
Mr. McGarry said the art gallery would have to come up with money for the property, but he said some prominent Ottawa philanthropists would likely help in this cause. He is hoping to make a case for the gallery moving into 50 Sussex to Lawrence Cannon, the federal transport minister and MP for Pontiac, who has cabinet responsibility for the NCC and who will have to sign off on any long-term lease of the building. Ottawa Art Gallery supporters who are eyeing the Sussex Drive property are worried that the exhibition space will slip through their fingers without any real public debate. "We're all somewhat concerned about decisions being made behind closed doors," said Mr. McGarry. "I'd hope they'd give us a chance before it's decided without public input." Since the election and the collapse of the rail project, the gallery has set its sights on the Canada and the World Pavilion. Letters to that effect have been sent to Prime Minister Stephen Harper, Transport Minister Lawrence Cannon (who is the minister responsible for the NCC) and other federal officials. A public petition has also been started. The gallery believes public pressure on federal politicians is the best way to ensure the NCC delivers the building. The NCC maintains it must first determine whether the building is suitable for use within the "federal family" -- government departments, agencies and foreign embassies. "I asked them," O'Brien said, "why they couldn't get around that." An answer was apparently not forthcoming. In fact, the NCC seems to be offering no encouragement to the Ottawa Art Gallery. Hence the decision to lobby politicians. The Ottawa Art Gallery's petition is online at their website. NCC spokesman Mario Tremblay said yesterday that the commission has been discussing "informal proposals" with some embassies about the building. He said no formal proposal has been received. The pavilion, just down the street from the prime minister's residence at 24 Sussex Drive and the Governor General's residence at Rideau Hall, was built at a cost of $5.7 million to federal taxpayers. It was operated as a mini-museum, celebrating the accomplishments of Canadians, but closed in 2005 due to budget cuts at the NCC. It features spectacular views of the Ottawa River and is part of the capital's historic Confederation Boulevard, a ceremonial route that includes Sussex Drive and Wellington Street. Mr. Tremblay said the commission is trying to find the right match for the property within the "federal family." That includes federal departments, Crown agencies, non-governmental organizations and foreign embassies -- organizations that all serve a national interest for Canada. The NCC has long been obsessed with encouraging such architectural mediocrities as the embassies of Saudi Arabia and Kuwait on Confederation Boulevard, claiming that doing so in some way communicates Canada to Canadians. Or something. In any case, some locals are suggesting to instead use the pavilion to house the Ottawa Art Gallery and the Firestone Collection of Canadian Art, given to Ottawa by Jack and Isobel Firestone in the 1970s. The 1,600-piece collection - valued at more than $11 million - includes works by prominent Canadian artists such as A.Y. Jackson, Arthur Lismer, Lawren Harris, A.J. Casson, Emily Carr and Jack Shadbolt. The art is currently housed in Arts Court on Daly Avenue. The National Capital Commission removed bureaucratic hurdles to the expansion of one of Ottawa's worst roads Thursday, following pressure by angry area politicians. The uproar began after the NCC sent a letter to city officials this week suggesting an internal review might prevent it from selling a parcel of land critical to the planned widening of Limebank Road. [...]Nepean-Carleton member of Parliament Pierre Poilievre said the NCC relented Thursday after he met twice with federal Transport Minister Lawrence Cannon to voice his displeasure. "When I learned the NCC was willing to further delay that expansion, I hit the ceiling and told the minister we needed to act immediately to get them out of the way," Mr. Poilievre said. "I'm very pleased we were able to remove this obstacle quickly, so it doesn't cause any further delays." He added the City of Ottawa informed him it restarted planning work in the area Thursday afternoon. In a statement last evening, the National Capital Commission confirmed it has approved disposal of the land, located south of Hunt Club Road and North of Tom Roberts Road. [...]An official couldn't elaborate, but it appears direction only came after furious complaints from Mr. Poilievre and Gloucester-South Nepean Councillor Steve Desroches. Tests on the house determined the well water used for drinking was contaminated with uranium and E. coli bacteria and the air inside the house contained between 3.5 and five times the Canadian guideline and between seven and 10 times the U.S. guideline for radon gas, a leading cause of lung cancer. Mr. Conacher's well water was interrupted several times, pipes leaked and the drinking water sometimes smelled of heating oil from an underground tank. The house was contaminated with mould, and the septic tank overflowed into the backyard. Mr. Conacher asked the Régie du Logement to order the NCC to refund $58,560 in rent from June 2001 and pay $8,800 for his inconvenience. The NCC had declared the house uninhabitable and told Mr. Conacher it would be demolished because it would cost $30,000 to seal the floors and basement walls and install ventilation equipment to rid the house of radon gas. He abandoned the house and moved out to live with friends between Dec. 1, 2005, and Sept. 30, 2006. The Régie du logement decided the house should be demolished instead of repaired, but ordered the NCC to pay Mr. Conacher $6,348 to cover three months of rent and moving expenses and $4,909 in additional compensation. "The NCC told me in May 2005 that if I didn't like the house, I should move out," Mr. Conacher said. "I told them I had a right to live in a house that was in habitable condition and they should clean it up. "They said they would demolish the building and kick me out at the end of my lease in May 2006. I stopped paying rent and abandoned the house, but they went after me for $14,000 of unpaid rent." Mr. Conacher said his former house has been demolished, but up to 10 NCC rental homes near Kingsmere and Meech lakes will have to be repaired or removed because of radon gas and uranium contamination. Hugh Batchelor, another Kingsmere Lake resident, said he stopped paying rent to the NCC in July 2006 because of radon gas and mould problems in his basement and received an eviction notice before Christmas. He lives in Perth now and spends little time in the house. NCC spokesman Mario Tremblay said about seven of the commission's 28 rental houses in Gatineau Park exceed Canadian standards for radon gas of 800 becquerels per cubic metre of air. He said one house will be demolished because it is in poor condition and the NCC will work with the other tenants to limit their exposure to radon. "The NCC has always been a responsible owner with respect of radon and uranium in this area," Mr. Tremblay said. "It is part of the NCC's continuous plan to communicate with the tenants whose properties are affected by radon and uranium." In fact, the NCC was informed about the problems of uranium and radon gas in late 2003 by an environmental consultant they hired to do testing, but did not inform their tenants about the problems until April 2005. The NCC is one of the largest landlords in the Ottawa region, and rents are rents, even for a house you're going to demolish. All this talk of bad behaviour brings to mind the National Capital Commission, the custodian of federal activities and lands in the capital. It has been boorish in the past, alienating the citizens of Ottawa and Gatineau in the process. For example, with its misguided plan to add a third lane to Champlain Bridge, it plugged a residential area of Ottawa with traffic - in the process destroying one of the NCC's own scenic driveways along Island Park Drive. Community groups across the north end of Ottawa fought this bad planning, taking the NCC to Federal Court and bankrupting themselves in the process. 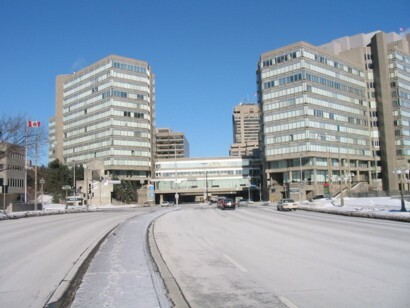 As a result, the NCC caused many across the city to consider the Crown corporation boorish. [...]After a while, the citizens, critics and politicians ganged up on the NCC and forced the federal government to create the NCC Mandate Review to investigate reforming the Crown corporation. Last week this column looked at the panel's misguided recommendations to give this dysfunctional operation more power. Given its chequered past, it would be foolhardy to allow the NCC a stronger mandate. Instead, when the people of this community feel they can trust the NCC, perhaps then it will be time to bolster its mandate. In the meantime, it is best to leave such fields as transportation and planning (as suggested by the panel to be moved to the NCC) to the cities, where there is accountability and skill in such matters. [...]It is through transparency and recognition of local needs that the NCC will regain its long-lost trust and stature. It doesn't need more power. The NCC must warm to the community and, in turn, the community will return that goodwill. But it will take time to repair the damage done over the past decade or more. Giving more power to an organization that has botched its planning role so badly is like expecting your teenager, who just totalled the family Toyota, to drive better by giving the youngster a Porsche. For example, the NCC would have a "new focus" on heritage, according to the report. Odd that recommendation, given that the NCC and its forerunners put the word flats in LeBreton Flats when it demolished that neighbourhood and left it empty for half a century. And then there were its plans to move or dismantle buildings of historical significance on Sparks Street. The panel, chaired by Gilles Paquet, would see a NCC that would put "new focus on the core of the capital," a core it almost destroyed with its plans to remove a large number of vibrant businesses and institutions for an ill-considered plan to widen Metcalfe Street. As well, the report recommends "a renewed emphasis on the planning function." Over the past few decades, the NCC has not planned well. Now, if the panel has its way, we would see more of this. In a move that could result in inefficient area job and economic growth, the report suggests giving the NCC the power to co-ordinate the 75/25-per-cent split in the allocation of federal government development between Ottawa and Gatineau. Imagine waiting at LeBreton Flats-development speed for approval of a new home, for say, the RCMP. And furthermore, why should federal investment be confined to a cross-border quota? Perhaps it would be better for the feds to simply build where it makes the best economic and planning sense. And this proposed mandate is far beyond the capability of the NCC when you look back at its slow planning and approval processes. The NCC could paralyse federal government growth in the area. The panel perpetuates the myth that the rest of the country cares about the activities of the NCC. "Both the national and local communities have to be kept informed of how the national capital coordinating agency is carrying out its tasks," the report says. "The capital city has to speak to the country," the report says in another nose-stretcher. In fact, the rest of the country doesn't spend much time thinking about the capital, and few Canadians outside the Ottawa area have even heard of the NCC. Realistically, the Crown corporation is another form of area government and thus needs to address regional issues effectively. If it does that, the NCC, in conjunction with the only Canadians preoccupied with health of the capital -- the residents of the region itself -- will help build a city that will attract Canadian visitors. The panel suggests the NCC play a bigger role in regional transportation, but the Crown corporation has consistently failed in that function. The third lane built on the NCC's Champlain Bridge pours traffic into residential areas; the NCC has so far failed to develop a plan for interprovincial bridges; and the NCC was so slow off the mark that the City of Ottawa had to purchase the Prince of Wales railroad bridge across the Ottawa River to preserve it for transit. The report gives the NCC much advice in the form of glossy phrases that don't mean anything. The NCC is "the main instrument of the federal government charged with the coordination of all activities pertaining to the ongoing planning, stewardship, and celebration of the capital of Canada." If my editor called me into his office to talk to me about sharpening my focus, then told me I must plan, steward and celebrate the editorial pages and mobilize sources to produce a true newspaper experience, I wouldn't know where to begin. The panel is asking the NCC to do everything and nothing, which is how the NCC got in the position of needing a review in the first place. The panel all but ignored its first and most important task. It didn't ask the question: Does the capital region need the NCC? [...] Then it bewailed the poor public image of the NCC, noting the calls for the organization's reform or elimination. It called that an "unfortunate situation" and blamed the image problem on misunderstanding. Sure, it's unfortunate if you're a supporter of the NCC. If you're a disinterested observer -- as a review panel should be -- it's not unfortunate that many people dislike the NCC. It's merely a fact. [...] Apparently, there are "opportunities and potential that it can leverage in pursuing the important national undertaking," the "progress and development of Canada's capital." So it would be useful to know what progress will mean to the revamped NCC. Will it look anything like the City of Ottawa's definition of progress? Will it be limited to useful interprovincial projects, such as a new bridge over the Ottawa River? Or will it be similar to the beautification plans of the old NCC? Are there statues involved? Ceremonial boulevards? Is my neighbourhood likely to be razed? Who knows? [...] Still, let's be optimistic for a moment. It's a new year, and a good time for optimism. It would be wonderful to end up with an open, accountable NCC that did not do anything any other agency could do. It would be wonderful to end up with an NCC that could make the municipal, provincial and federal governments co-operate effectively on projects. That isn't what the review panel has given us. It's given us an Ottawa special: meaningless language that protects the status quo.